The Golden Retriever (also known as Yellow Retriever) has one of the most well documented and successful breeding histories among dogs. It was bred in England in the 1800's to push through heavy foliage and swim in cold water for long distances, gently retrieving game. Golden Retrievers were brought to America in 1900 and first recognized as a distinct breed in 1912. They went quickly from being a well-liked hunting dog to a fashionable show and obedience dog, to an extremely popular pet. Famous Golden Retrievers include Gerald Ford's dog Liberty and Dean Koontz's dog Trixie Dean Koontz wrote two books from her perspective and gave her writing credits, making her the world's first dog author! 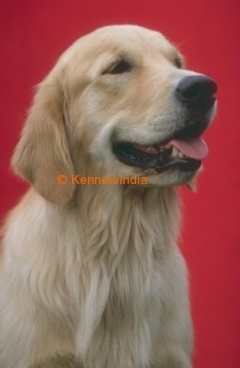 The Golden Retriever has a shoulder height of 51-61 cm (20-24 in) and weighs 25-34 kg (55-75 lbs). Golden Retrievers have a broad, rounded skull, short ears, round feet and thick, flat tails. They have black noses and kind, brown eyes. The Golden Retriever has a double coat which comes in various shades of gold or cream (it should not be red). The outer coat is smooth, wavy and water resistant and the undercoat is thick, soft, and weather resistant. The tail and legs have longer hair. The Golden Retriever sheds heavily. The Golden Retriever is very noble, self-confident, sensitive, intelligent, and adaptable. They are one of the world's most popular pets and make great companions. Golden Retrievers are sturdy, strong, and kind, known for their adeptness at hunting and their strength of character. Golden Retrievers bark infrequently, but do bark when startled, making them poor guard dogs. Golden Retrievers easily get along well with their friends and companions, but can be belligerent with unknown visitors. They get along especially well with children, with whom they are gentle and patient. They are also friendly with other dogs and other household pets. The Golden Retriever is very devoted to family, and eager to please. The Golden Retriever is simply loving and loveable! The Golden Retriever requires regular grooming with a brush and comb at least twice a week. The ears should always be kept clean. The Golden Retriever should not be kept outdoors. If they are left alone frequently or for extended periods of time, they will become unhappy and mischievous. Skin allergies may occur, and should be examined by a veterinarian immediately. Golden Retrievers live 10-12 years. The Golden Retriever is particularly easy to train. They are very sensitive to harsh treatment, so excessive strictness is not recommended. They learn very quickly and are extremely adaptable, making them perfect for therapy or service jobs. Golden Retrievers can learn many tricks and will remember what they are taught for the rest of their lives. Obedience classes are recommended. Golden Retrievers have above average needs for exercise, although they will adapt themselves to the exercise habits of your family. The Golden Retriever requires frequent human interaction. It should be challenged with obedience lessons or allowed to retrieve or play active games. Golden Retrievers tend to be more active in the morning and at night than in the middle of the day.